Caryl Phillips was born in St Kitts and came to Britain at the age of four months. He grew up in Leeds and studied English Literature at Oxford University. He began writing for the theatre and his plays include Strange Fruit (1980), Where There is Darkness (1982) and The Shelter (1983). 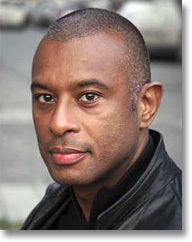 He won the BBC Giles Cooper Award for Best Radio Play of the year with The Wasted Years (1984). He has written many dramas and documentaries for radio and television, including, in 1996, the three-hour film of his own novel The Final Passage. He wrote the screenplay for the film Playing Away (1986) and his screenplay for the Merchant Ivory adaptation of V.S.Naipaul's The Mystic Masseur (2001) won the Silver Ombu for best screenplay at the Mar Del Plata film festival in Argentina. His novels are: The Final Passage (1985), A State of Independence (1986), Higher Ground (1989), Cambridge (1991), Crossing the River (1993), The Nature of Blood (1997), A Distant Shore (2003), Dancing in the Dark (2005) and Foreigners (2007). His non-fiction: The European Tribe (1987), The Atlantic Sound (2000), and A New World Order (2001). He is the editor of two anthologies: Extravagant Strangers: A Literature of Belonging (1997) and The Right Set: An Anthology of Writing on Tennis (1999). His work has been translated into over a dozen languages. He was named Sunday Times Young Writer of the Year in 1992 and was on the 1993 Granta list of Best of Young British Writers. His literary awards include the Martin Luther King Memorial Prize, a Guggenheim Fellowship, a British Council Fellowship, a Lannan Foundation Fellowship, and Britain's oldest literary award, the James Tait Black Memorial Prize, for Crossing the River which was also shortlisted for the 1993 Booker Prize. A Distant Shore won the 2004 Commonwealth Writers Prize; Dancing in the Dark won the 2006 PEN/Beyond the Margins Award. He is a Fellow of the Royal Society of Literature. He has taught at universities in Ghana, Sweden, Singapore, Barbados, India, and the United States, and in 1999 was the University of the West Indies Humanities Scholar of the Year. In 2002-3 he was a Fellow at the Centre for Scholars and Writers at the New York Public Library. Formerly Henry R. Luce Professor of Migration and Social Order at Columbia University, he is presently Professor of English at Yale University. He is an Honorary Fellow of The Queen's College, Oxford University. A regular contributor to The Guardian and The New Republic, his latest book, In the Falling Snow, will be published in 2009.